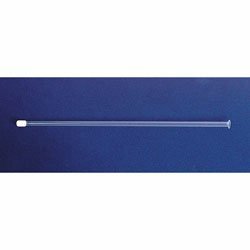 Nasco Disposable Sheath Protector - C11050N: The disposable 12" sheath protector is used as a protective cover on insemination sheaths. The purpose of this protector is to aid against the transfer of contaminants into the uterus during the insemination process. Simply apply a slight forward thrust when reaching the exterior of the cervical canal and the insemination sheath will "pass through" the protective tip allowing the tube to proceed through the cervix. For Continental or French-style sheaths. Pkg. of 25.